Yoga for your back can help to ease discomfort and build strength. It is important to begin your yoga practice with the guidance of a qualified yoga teacher so you can learn variations and adaptations of poses to suit your body. If you're already attending regular yoga classes and occasional yoga workshops, you may find the following yoga sequence useful for your home practice. Note: remember to exercise within your limits. Never force or strain. If you feel dizzy, light headed, faint or if you experience any other discomforts, stop exercising immediately and seek medical advice. Before any workout you should stretch to warm up and cool down afterwards. No heavy meals for two hours before workout. Keep hydrated by drinking water before during and after yoga practice. Exercise in a light area, with enough free space around you. Wear comfortable clothing so you can move freely. If you are unsure about any medical issues please consult your doctor particularly if you are pregnant, nursing, taking medications, or have any existing medical conditions. Find out about Kettering yoga workshops at Mind Body and You. Yoga helps to build core strength. A stronger core is a good foundation for improved posture and a stronger back. NOTES: Please begin your yoga practice with the guidance of a qualified yoga teacher. Remember to exercise within your limits. Never force or strain. If you feel dizzy, light headed, faint or if you experience any other discomforts, stop exercising d and seek medical advice. Before any workout you should stretch to warm up and cool down afterwards. No heavy meals for two hours before workout. Keep hydrated by drinking water before and after yoga practice. Exercise in a light area, with enough free space around you. Wear comfortable clothing so you can move freely. If you are unsure about any medical issues please consult your doctor particularly if you are pregnant, nursing, taking medications, or have any existing medical conditions. An 8 minute tune called 'Weightless' is scientifically claimed to be the most relaxing tune ever. Listen to the tune by clicking here. The music was engineered, by scientists and Manchester based band 'Marconi Union', to slow down the heart rate to 50 beats per minute which helps to reduce blood pressure and ease anxiety. Supposedly more relaxing than a massage, a walk or a cup of tea, it's advised that you don't play this tune whilst driving. "Weightless is ideal for putting on at the end of a stressful day and unwinding." 10. Cafe Del Mar - We Can Fly. Here's a lovely slow flow yoga sequence created by Leena Miller Cressman at Queen Street Yoga in Canada. This vinyasa (flowing) sequence will gently stretch and relax the whole body. Please feel free to share it. 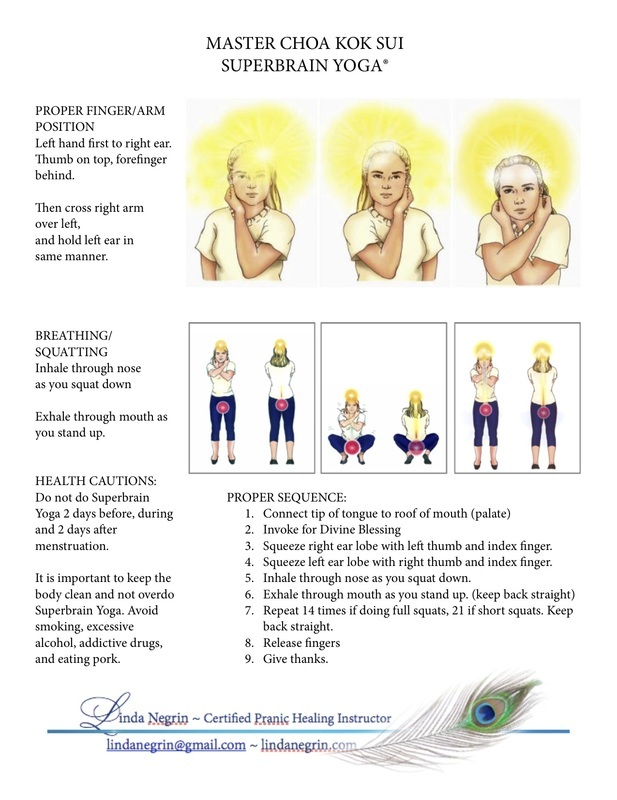 For a printable version of the yoga sequence click here. To find out about our weekly yoga classes in Kettering click here. Super brain yoga is a fun and easy 3 minute technique to help maximise your brain power. Based on research by Dr. Joie P. Jones of the Dept. of Radiological Sciences at the University of California, the exercise works using the body’s energy centres (major accupuncture points) which absorb, digest, and distribute energy to different parts of the body. After doing the squat exercise that's synchronised with the breath, an EEG scan shows the right and left hemispheres of the brain have synchronised, according to Dr. Jones. It's claimed that the habit of practising Superbrain Yoga makes you smarter and more psychologically balanced. Is it worth a try for just 3 minutes a day?